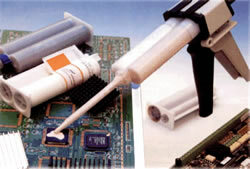 Ceramic-filled one-part and two-component silicone elastomers. Because of their various thermal conducting capacities and their differing compressibility behaviors, their good dielectric properties and the absence of any solvents, these materials are ideally suitable for encapsulating or dispensing. The wide range of different material viscosities makes this product of interest for “Wet-in-wet” production. Customer specific solutions for the compound technology and processing technology is our strength. Kerafol’s modern dispensing technologies allows the application of heat conducting material onto the most diverse heat sinks or custom-specific components. Just Contact Us and we will be happy to help you in finding a solution. Click to Get a Quote for Keratherm Sealing Compound!